Theorem. Every triangle is isosceles. Proof. Consider an arbitrary triangle $\triangle ABC$. 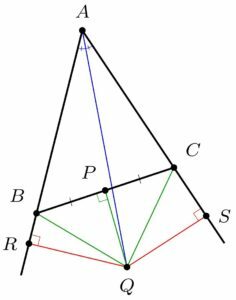 Let $Q$ be the intersection of the angle bisector (blue) at $\angle A$ and the perpendicular bisector (green) of $BC$ at midpoint $P$. Corollary. Every triangle is equilateral. Perhaps you object to my figure, because depending on the triangle, perhaps the angle bisector of $A$ passes on the other side of the midpoint $P$ of $BC$, which would make the point $Q$ lie outside the triangle, as in the following figure. Nevertheless, essentially the same argument works also in this case. 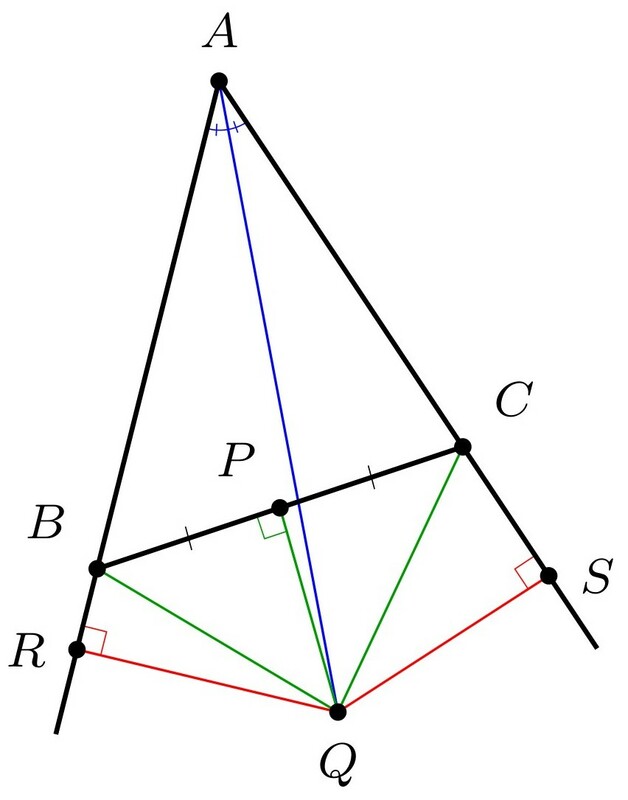 Namely, we again let $Q$ be the intersection of the angle bisector at $\angle A$ with the perpendicular bisector of $BC$ at midpoint $P$, and again drop the perpendiculars from $Q$ to $R$ and $S$. Again, we get $BQ\cong CQ$ by the Pythagorean theorem, using the green triangles. And again, we get $\triangle ARQ\cong\triangle ASQ$ since these are similar triangles with the same hypotenuse. So again, we conclude $\triangle BQR\cong\triangle CQS$ by hypotenuse-leg. So we deduce $AB\cong AR-BR\cong AS-CS\cong AC$, by subtracting rather than adding as before, and so the triangle is isosceles. Question. What is wrong with these arguments? Please post your answers in the comments below. The argument is evidently due to E. A. Maxwell, Fallacies in Mathematics, 1959. I first heard it years ago, when I was in graduate school. Shortly afterward, my advisor W. Hugh Woodin happened to be a little late to seminar, and so I leaped to the chalkboard and gave this proof, leaving the distinguished audience, including R. Solovay, scratching their heads for a while. Woodin arrived, but Solovay wouldn’t let him start the seminar, since he wanted to resolve the triangle argument. What fun! This entry was posted in Exposition, Math for Kids and tagged geometry, kids, paradox, playful paradox by Joel David Hamkins. Bookmark the permalink. I certainly had to scratch my head for a long time, but I think I’ve got it now. First, I spotted that if the triangle is isosceles, then the point Q isn’t well-defined. Although I don’t immediately get any conclusion from this observation, it is rather suspicious, and it also means that for many triangles it isn’t easy to guess where Q will be. Anyhow, I then drew a diagram fairly carefully, starting with a right-angled triangle that had one non-hypotenuse side a lot shorter than the other. That enabled me to see that you had pulled the wool over my eyes with your two cases, and in fact, although the lengths that you claimed were equal were indeed equal, I had to subtract one of them and add the other. Since it is false that all triangles are isosceles, and since the rest of the argument appears to be correct, I deduce that this must always be the case. Indeed, I think you’ve got it. To present the “theorem” to someone else, which is always fun in person, I recommend practicing a little, since you want to draw the figures well enough to make the argument work. My habit is to hold the second case in reserve, in case my audience should actually make that objection, so I can “address” it. P. S. You can move the vertices A, B, C to see what happens. Your geogebra application is great! Did you just write the code for this case now? Wonderful! I teach Geogebra to students. It took 10 minutes to make your construction (5 of which were spent on getting all the colors right). Thanks very much for having done so! And I appreciate that you made the colors match my figures. Geogebra seems amazing—I think I’ll have to take it up. Proving that great minds think alike my first thought was if I try to draw this myself Q is always outside the triangle let’s check that on geogebra. Second thought was its a great proof by contradiction that Q must be on the outside I don’t need to even think of any further logic. It isn’t enough merely to note that $Q$ is always outside the triangle, because at the end of my post, I handle the case that $Q$ might be outside. So what was wrong with my reasoning in that case? If you check each step carefully, you will find that all the triangle congruency claims are correct. So what is wrong? Therefore ZFC is inconsistent! In fact, I think we can even get it all the way to PA being inconsistent! Very nice. When the perpendiculars are dropped from Q, forming R and S, one point is within the triangle and the other is outside, on the original edge extended. What you call BR and CS are indeed equal in length, but one must be added and the other subtracted. We end up with basically AB = x + y, AC = x – y. This does show that x is the average of AB and AC. Thanks for that earlier reference! I had only had the 1959 Maxwell reference. The angle bisector and the opposite side’s perpendicular bisector must coincide to give an isosceles triangle. Likewise, all three angle bisectors and their opposite side’s perpendicular bisectors must coincide to give an equilateral triangle. The assumption was there was only one intersection point Q. Are you saying that in the case there is only one intersection point Q, then the argument works? If this were true, then still it shows that every triangle is isosceles. So your objection can’t be the real problem. In case there is only one intersection point, point Q and point R must coincide. This creates degenerate triangles, namely △BQR and △CQS. It is impossible to have a degenerate triangle. It isn’t true in general that Q and R must coincide when those lines have an intersection point, and you can see this by making a careful drawing of the construction. So it seems to me that you don’t yet have your finger on the flaw in the proof. Thanks to the Geogebra program submitted by Andrej Bauer we can see an isosceles triangle when the angle bisector and opposite side’s perpendicular bisector’s coincide. 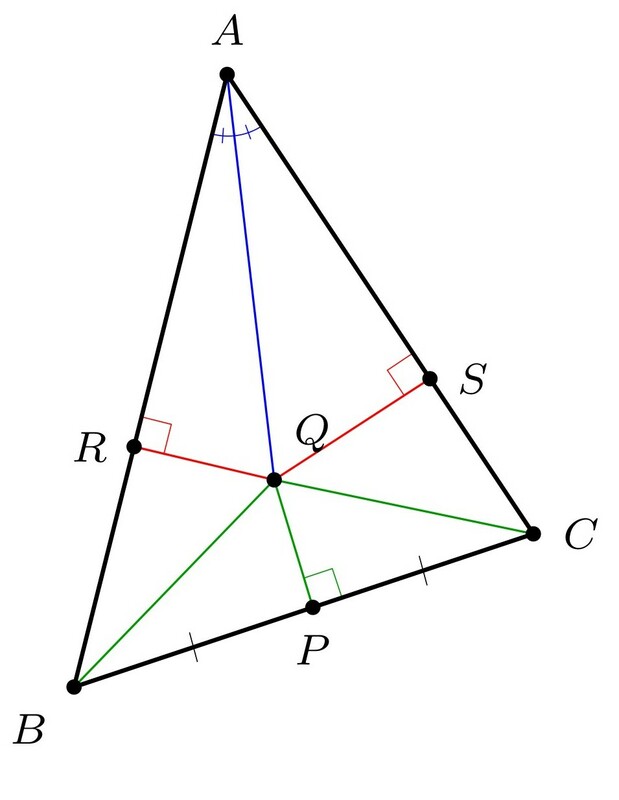 Also, we can see that when points R and B coincide and points S and Q coincide we have an isosceles triangle with the degenerate triangles mentioned earlier. And when points P and Q coincide the whole triangle degenerates.I really didn’t want to put Q on the outside of the triangle ABC. But once you see the general case requires Q to be outside the triangle, it should be clear the proof is flawed in the segment addition. Well… maybe it wasn’t so obvious! I think you’ve got it! I like false proofs, and I enjoyed this problem.